Every murder is unique. Two nineteen-year-old sons of wealthy Chicago families kill a neighborhood boy in 1924 because they think they’re smart enough to get away with it. A barely-educated drifter with artistic talent kills three persons in a New York city apartment in 1937 because he believes it is necessary. While these horrendous incidents have little in common, they are linked and preserved in part in the Bernard Glueck Papers in the History of Medicine Division at the National Library of Medicine. Dr. Bernard Glueck produced psychological evaluations of the murderers for the legal defense in each case. 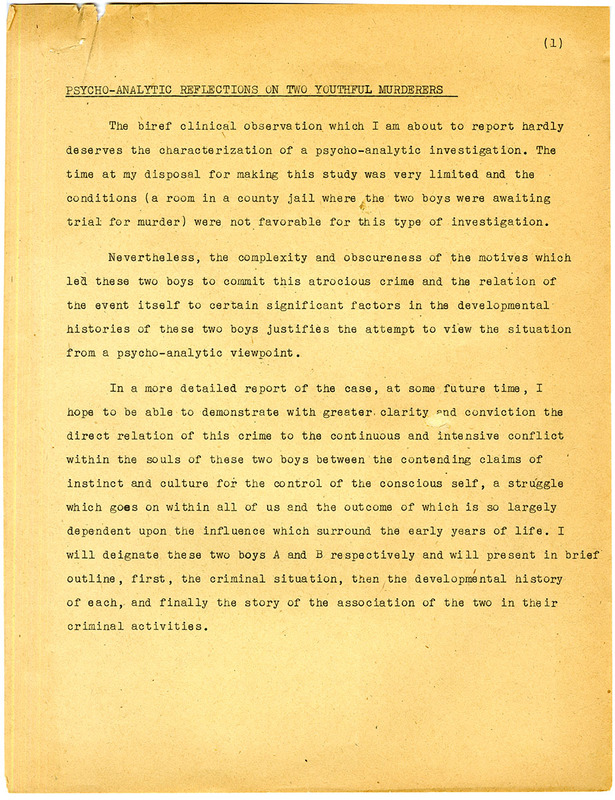 In 1924 Clarence Darrow and his defense team needed psychological evaluations of their clients, Nathan Leopold, Jr. and Richard Loeb. Having already pled guilty to the murder of Bobby Franks, the defense wanted to introduce in-depth studies of the experiences and backgrounds of the two men to persuade the court that life sentences were more appropriate than execution. Three experts were chosen. Dr. Glueck was nationally known for his expertise in criminal psychiatry, William Alanson White had two decades’ experience studying and treating the criminally insane, and William Healy was a leader in the child guidance movement and an expert in delinquency. Dr. Glueck’s psychiatric expertise and reputation met the needs of defense attorneys seeking to save their clients from execution. An émigré from Poland to the United States while in his late teens, Bernard Glueck studied medicine at Marquette and Georgetown Universities. Upon graduating with a degree in psychiatry he was employed by the U.S. Department of the Interior at St. Elizabeths Hospital in Washington, D.C. in 1909. Under William Alanson White, Dr. Glueck treated criminally insane inmates while studying and writing about the forensic factors contributing to their incarceration. 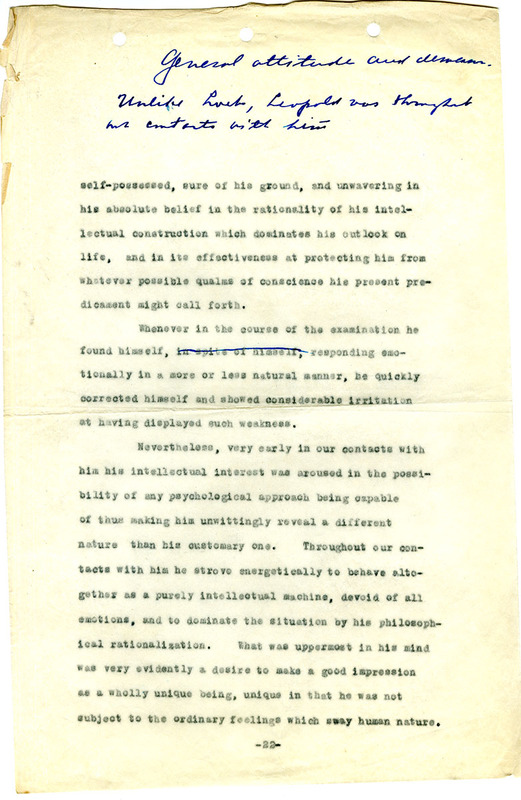 A page from Dr. Glueck’s report on Leopold and Loeb. Here he describes Nathan Leopold’s demeanor when being interviewed. By 1916, Glueck was an integral participant in the Mental Hygiene movement, which encouraged the establishment of mental health care facilities and studied the causes of mental illness. With these goals in mind, Glueck led the newly-founded Psychiatric Clinic at Sing Sing prison in 1916. He conducted detailed studies of inmates’ lives to determine the causes for their criminal behavior, whether through disease or social development, and to use this information to help establish preventive mental health programs. 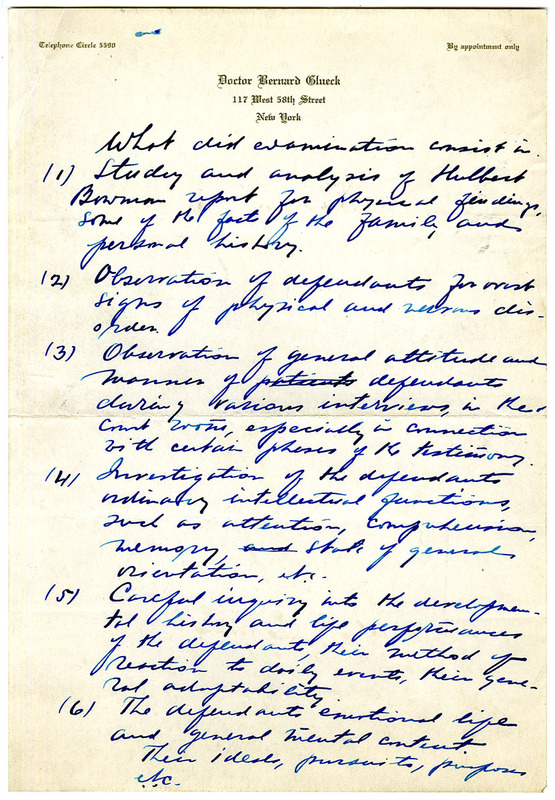 Always looking for constructive uses for his work, Dr. Glueck wrote an account of the Leopold and Loeb case with redacted names for use in teaching social workers. Consequently, from 1918 through 1924 Dr. Glueck taught mental hygiene principles to students of social work in New York City, emphasizing childhood development. He founded Stony Lodge, a facility in New York state offering in-patient psychotherapy, in 1928. 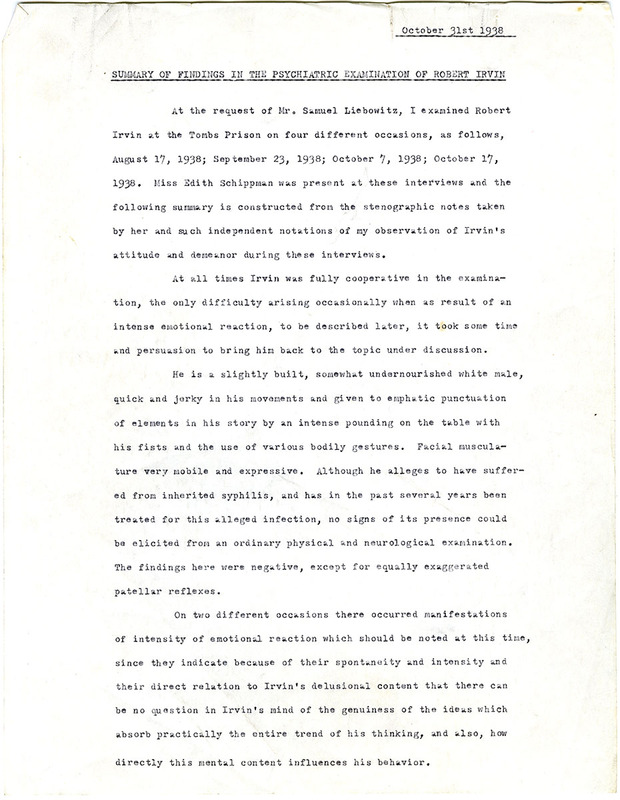 Glueck’s evaluation of the defendants, Leopold and Loeb, applied principles of developmental inquiry within the context of his intimate knowledge of direct criminal ramifications gained at St. Elizabeths and Sing Sing. His three-part report considered each defendant’s individual experiences and then evaluated the dynamic of their relationship with each other. Taking into consideration the early history of his physical weakness, the effeminizing influence of Miss Struthers, his later increasing conviction of sexual impotence, it becomes absolutely clear to one who is familiar with the manner in which man attempts to compensate for real or imagined inferiorities, that the impelling motive in the defendant’s criminal career was the motive of compensating through criminal prowess for his feeling of inferiority. He all but diagnoses Loeb as schizophrenic, observing that his self-hypnotizing criminal fantasies practically removed the element of free will from his actions. The great facility for intellectual achievement, coupled with the extremely ready phantasy play which has always characterized his mental functions, made it possible for him to ignore and escape reality whenever reality offered unpleasant or difficult situations which had to be faced. Glueck concludes that Bobby Franks’ murder was possible only by the strange and unlikely combination of two complementary personalities. Leopold was willing to engage in criminal activities with Loeb only in exchange for Loeb’s sexual acquiescence. Likewise, Loeb was willing to indulge Leopold’s proclivities in order to have a criminal accomplice and admirer. In 1938, Dr. Glueck was again asked to examine a murderer. Celebrated New York defense attorney Samuel Liebowitz sought to establish Robert George Irwin’s mental incapacity to avoid his otherwise certain conviction and execution. To enhance the impact of the psychiatric testimony presented, Liebowitz chose Dr. Glueck not only for his well-known expertise but also because he rarely testified in court. He believed Glueck’s testimony would hold more weight with the court because he hadn’t a reputation as a routine “hired-gun” expert. Although Irwin committed the murders and was apprehended in 1937, his trial and sentencing were delayed until late in 1938. 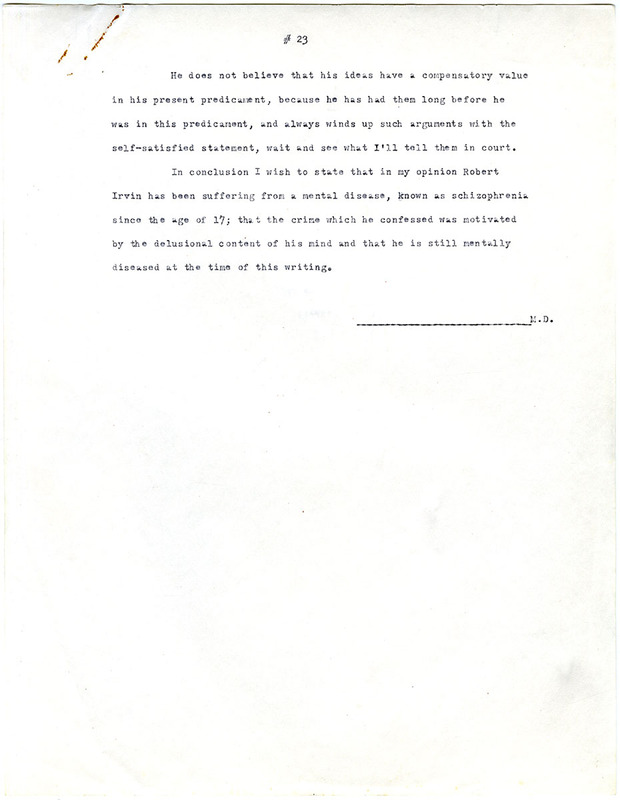 Two psychiatrists examined Irwin, Glueck and Dr. L. E. Hinsie. Glueck determined that Irwin’s triple murder fit within the parameters of a consistent delusion. Since he was 17, Irwin had been obsessed with an imagined insight into achieving god-like power and knowledge. Through successful visualization he felt he could know everything that could be known and become physically transcendent. He was driven to eliminate distractions from his efforts at visualization, even including an attempt at self-castration. In March 1937, he determined that Ethel Gedeon, a woman he was obsessed with, had to be killed in order for him to maintain focus. He visited her mother’s apartment and, not finding her there, killed Ethel’s mother, sister, and the man who was boarding with them. Dr. Glueck concludes that Robert Irwin was mentally incapacitated at the time he committed three murders. Irwin, Glueck reported, had developed schizophrenia fourteen years earlier and was still suffering from it when he committing the murders. In his opinion, Irwin was not criminally liable but criminally insane. His evaluation was accepted by the court, and Irwin lived out his life in secure mental institutions. Dr. Glueck’s conclusions regarding Leopold and Loeb also helped convince the court to spare their lives. While Glueck believed they were also mentally incapacitated, their guilty plea precluded the introduction of insanity as a factor in their sentencing. The two were spared execution and sentenced to life sentences. Learn more about Dr. Glueck and explore the finding aid for the Bernard Glueck Papers 1903-1972 in the History of Medicine Division at the National Library of Medicine.